There are some cast changes for the anniversary tour of the Rocky Horror Show. Ben Forster has been playing the role of Brad Majors but is due to leave on 2nd March so that he could play the lead again in the now postponed tour of Jesus Christ Superstar. 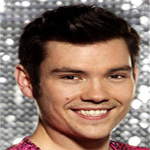 Sam Attwater will take on the role from 4th March to 20th July. Sam is probably best known for playing Leon Small in EastEnders. He won the sixth series of Dancing on Ice in 2011 and most recently appeared as Norman in the West End in Dreamboats & Petticoats. Roxanne Pallett is due to leave the Rocky Horror Show on 11th May when the role of Janet will be played by Dani Harmer from 13th May to 17th August. Dani played the title role in Tracy Beaker and was one of the finalists in the last series of Strictly Come Dancing when she was partnered by Vincent Simone.